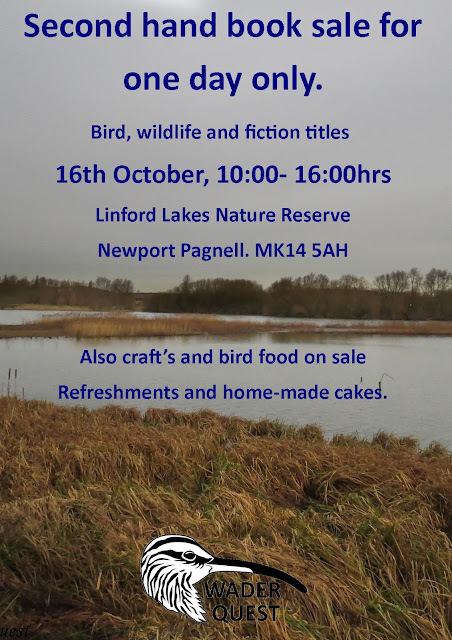 Wader Quest: Second hand bird and wildlife book sale; Milton Keynes. Second hand bird and wildlife book sale; Milton Keynes. Silly low prices to clear!! There will be an open day at Linford Lakes Nature Reserve (LLNR) near Milton Keynes on Sunday. LLNR is normally a permit only reserve so here is an opportunity to visit the reserve if you are not a permit holder. At the same time you will be able to browse the Wader Quest second hand books that we have for sale at prices that you won't be able to resist. All proceeds in support of Wader Quest. There will be other crafts and bird food available and also home made cakes for sale in support of the Friends of LLNR.